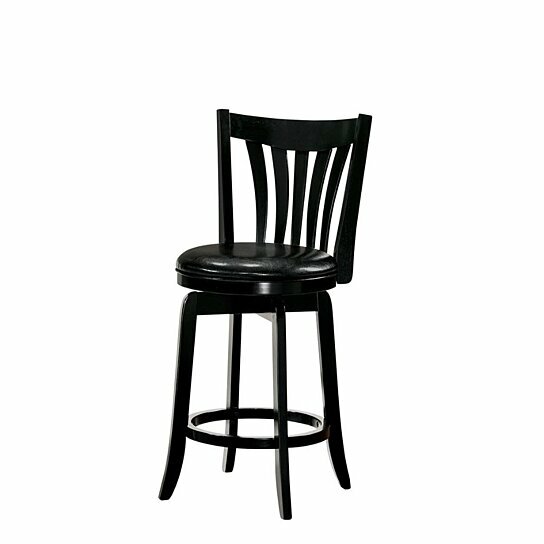 This 24" Bar Stool is designed with perfection and will make a great entrant into your home interiors. Made up of black wood that is extremely durable and will provide you with many years of solid use. It features curved slatted backrest attached with black faux leather upholstered padded seat that gives you comfort while seating. It is perfect to use in your bar spaces, kitchen counters and with counter height dining table as well. Constructed of wood and features black faux leather upholstered padded seat. It features comfy seat, supported by flared legs with round footrest. Perfect piece to add into bar settings, dining spaces and kitchen counters.